In 1995, at the age of eight, Una Waters survived a terrifying encounter at 30,000 feet aboard Flight 564 from Dallas to Las Vegas. It changed her forever. After 21 years, and a decade away from the Hopi Reservation where she grew up as a child, a surprise plea for help brings Una back, to solve a mystery that threatens their traditional way of life. The U.S. Army’s sudden interest regarding a cave discovery in the Sacred Peaks has triggered alarm, leading to violence. With the help of friends, new and old, Una must confront her painful past, seek proof to qualify the ancient site for protection under law, and stand up to a stiff-necked general, whose agenda is more concerned with retrieving a mysterious power source. T.J. & M.L. Wolf joined forces in the field of Healthcare, exploring mutual interest in the work of UFO researchers like Budd Hopkins and movie directors like Steven Spielberg. The History Channel’s “Ancient Aliens” became a focal point of their quest to uncover the truth regarding humanity’s purpose and how it pertains to our future. Married twenty years, they write Speculative Fiction and live in Boardman, Ohio with their six-pound Yorkie, who keeps the family in line. When Una Waters was nine years old, she had a strange experience. She spends the rest of her childhood impatiently waiting to get off the reservation, which she does when she turns eighteen. Now Una works for the Department of the Interior and is called back when the military starts performing operations on a mountain sacred to the Hopi. Of course Una is ready to fight for her people and ends up on an adventure beyond this world. This story combines history about Native Americans, the possibility of UFO’s and aliens, and a government conspiracy. Una has an interesting experience that shakes her at an early age and she watched the US government cover everything up. Now she works for the government and now has the knowledge to fight back when she learns of them trying to take over a sacred cave. From there we go on a race against time, following clues, and finding out the truth. Whenever you talk about aliens the Hopi will eventually work into the conversation because of the pictograms that resemble people in space suits or aliens. The Hopi mythology leads a lot to interpret to many people that believe in aliens. Just watch an episode of Ancient Aliens and you will understand what I mean. This part of the book I had no problem with. Unfortunately it was the execution of the story that cause me trouble. The narration was rough and jumped all around. It is the first book in the series and I know you have to work out the bugs but I think they could have reviewed it just one more time before releasing it. 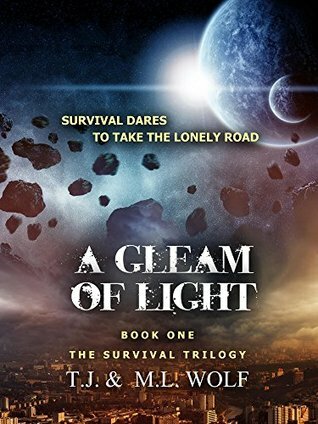 Having said that, A Gleam of Light is a good story and leaves thing open for the next book. I would be interested in reading the second book. I received A Gleam of Light from the author’s for free. This has in no way influenced my opinion of this book.